"295 McGowan and Dickson 10-7 68 Pier Ave."
Dateline: Thursday, June 25, 2009, 1800 hrs - 2300 hrs, Sangria Restaurant, 68 Pier Avenue, Hermosa Beach, California. It's now Official ! McGowan and Dickson are 10-7, e.g., out of service, retired, and otherwise on their own recognizance. Both of these LACo Lifeguard Captains were feted, fed, and swarmed by well wishers toasting and roasting to their multiple decade careers in service for the County. One on the boats (Dickson) and one who preferred to have sand between his toes (McGowan). "County Recurrent" News attended with its press pass and a digital camera and was able to snap some timeless photos of this event, so sit back and enjoy ! (Photo by John Longenecker. Photo courtesy of Greg Bonann. Photo shows Al Roker, at center, foreground, back to the camera, as he opens up his segment about "A CHANCE FOR CHILDREN"). Dateline: Monday, June 22, 2009 at approx. 0500 hrs - 0900 hrs. 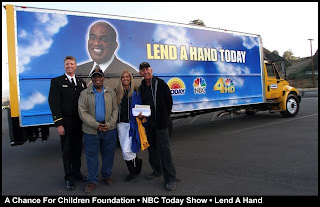 What: NBC's THE TODAY SHOW with Al Roker and their "Lend A Hand" Annual Charitable Program (http://today.msnbc.msn.com/id/31447842/) which donates funds and equipment, etc. to select, deserving charities. (Photo by John Longenecker. Photo courtesy of Greg Bonann. 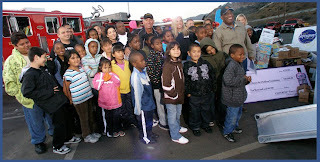 Photo shows the kids of ACFC with Greg, Tai and Al Roker). (Photo by John Longenecker. Photo courtesy of Greg Bonann. Photo shows, L2r: Lifeguard Chief Mike Frazer, Al Roker, Tai Collins and Greg Bonann). The recipient Charity turned out to be none other than "A CHANCE FOR CHILDREN" (ACFC), previously known as 'Camp Baywatch', the charitable foundation started by Greg Bonann and Tai Collins. The Donations included equipment, cash and a rockin' silver Mazda 5 wagon, totaling over $400,000. ACFC focuses its charitable efforts on supporting kids in the homeless community. Opening Segment - 7min. 6 sec. Second Segment - 4min. 46sec. We hope you will enjoy these photos which were taken at the request of Greg Bonann for inclusion in "County Recurrent". Participating in this live coverage of The Today Show were our own LACo Dept. 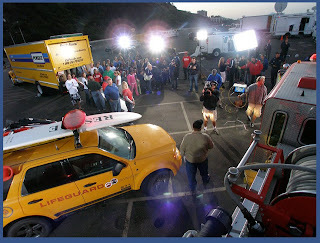 of Lifeguard Operations, the U.S. Coast Guard, the LACo Fire Dept's Fire Operations, the LAPD, with public safety personnel and first responders from each of these safety agencies, as well as staff from such corporate sponsors as MAZDA, OFFICE DEPOT, SCHOLASTIC, TYR, SPEEDO, CROCS, BULLFROG PENSKE Truck Rentals, OCEAN KAYAK, MALIBU MAKOS Surf Camp, DOCKERS, and many others. "It's On !" "Oh Yeah, It's On All Right !"